"This is a no-knead bread recipe that I put together using ideas from other recipes and my own variations. During the long fermentation period, the grains soften and swell to give the bread a wholesome and satisfying flavor and texture. It has a chewy crust that is crispy when toasted and a soft crumb. This bread is more convenient because it can be mixed one day and baked the next day when you have time. 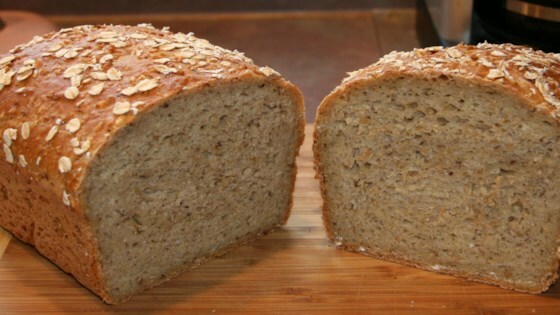 The long fermentation releases the nutrients of the grain and enhances the flavor of the bread." Heat a heavy skillet over medium heat. Add the steel cut oats; cook and stir until lightly toasted, about 5 minutes. Remove from heat. Combine bread flour, whole wheat flour, toasted steel cut oats, dry milk, sugar, gluten, salt, flax seeds, and yeast in the bowl of a stand mixer with a paddle attachment. Add 5 cups water, oil, and vinegar. Mix on low until all ingredients are moistened. Increase speed to medium-high; mix until gluten is developed and dough is elastic, about 5 minutes. Turn dough into a clean, oiled bowl. Cover with plastic wrap. Let rise in a warm place until doubled in volume, 1 to 2 hours. Stretch and fold dough 4 to 6 times. Place back in bowl, cover, and refrigerate 16 to 18 hours. Remove from the refrigerator 2 to 4 hours before baking. Turn out onto a well-floured surface; sprinkle top of dough with flour. Halve the dough; flatten each half. Fold in all 4 sides like an envelope; press edges together into the dough. Shape each piece into a loaf with the smooth side on top. Place in 2 loaf pans; cover with a non-terry towel. Let rise until dough just crests above the top of the pan, 45 minutes to 1 hour. Preheat oven to 500 degrees F (260 degrees C). Place a pan of water on the lower rack to produce steam for the bread. Whisk egg with 1 tablespoon water in a small bowl. Coat tops of loaves with the egg wash.
Bake in the preheated oven until browned, about 15 minutes. Remove the pan of water carefully; cover loaves with aluminum foil tents. Continue baking until an instant-read thermometer inserted into a loaf reads 200 to 205 degrees F (93 to 96 degrees C), 45 to 60 minutes more. Remove loaves from pans and cool on a wire rack. Toasted steel-cut oats may be substituted for the 9-grain cracked cereal. You can use dry baker's milk in place of the non-fat milk. Use any natural sweetener you prefer. Vegetable oil may be substituted with any nut oil or MCT oil. After coating your loaves with egg wash, feel free to sprinkle your favorite toppings on top. Another way to produce steam during the first 7 to 10 minutes baking is to spray the oven sides with water at least 3 times at 5 minute intervals.